1.Inflation of an airform, this is a waterproof membrane usually UV stabilised vinyl that is firmly attached to a ring beam foundation then blown up like a bouncy castle. 2. A polyurethane insulation is then sprayed onto the inside of the airform; reinforcing bar is pressed into the urethane ready for the final step. 3. 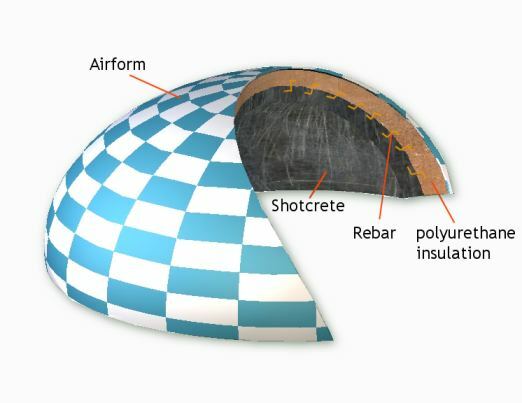 A form of concrete called shotcrete is sprayed onto the rebar and polyurethane, this forms the structural element of the dome. Monolithic domes are both efficient and incredibly strong structures; they take hurricane force winds and earthquakes in their stride. Speed of construction and flexibility are key features. Bulk storage, schools, churches and homes can be built using this system, by altering the airform, low profile, ellipsoid, hemispheres and even multiple domes can be constructed, in fact any shape that is inflatable could be built. Doors and windows of any shape can be easily incorporated into the structure. Being both well insulated and having a huge internal mass makes a monolithic dome one of the most heat efficient buildings you can build. 1. Polyurethane foam, vinyl and concrete are not the most sustainable materials to build with. Polyurethane foam is petroleum based, can''t be recycled easily and produces toxic smoke when it''s burnt. The vinyl airform again is petroleum based and there are some questions over the lifespan of the airform. At least the concrete is pretty permanent, even if it has a large initial co2 footprint. 2. If the vinyl membrane is damaged in any way water can seep into the insulation beneath which will end up like a huge soggy sponge. Fire, vandalism even falling tree limbs are a worry for the monolithic dome owner. All it takes is someone with a knife to ruin an air-form; kids with air rifles or bows and arrows could easily make holes in it. Air-forms can be repaired or covered in aluminium to protect them but it does increase the cost considerably. 3. Monolithic domes are virtually hermetically sealed, this makes them great for storing materials that need a constant humidity, but when it comes human habitation; washing, cooking and bathing all produce water vapour which has to be removed from the building by dehumidifiers or forced air ventilation, as there isn''t enough natural ventilation in this type of dome structure. The only way to get air movement through a dome structure is to have a hole covered with a cowl top dead centre of the dome. Hmmm, seems this humidity problem would be inherent with all structures that are clad to keep heat in, like tyvex, that is used in almost all new homes. From what I've read about the monolithic dome homes, and what I've heard from those I have talked to who live in them, they are quite satisfied with them. Try visiting other sites to learn more about modern homes and the moisture barriers used. There is always some sort of ventilation required to keep condensation at a minimum. There are always pros & cons to every building medium, don't you think. I would seem to think to pros out weigh the cons in this instance, especially if like you mentioned the dome had additional cladding or if the dome construction put the concrete on the outside, what is commonly referred to as an ecodome such as those dwelling built in warmer climates. Check it out, the Dome home is very versatle. The dome is a restrictive geometry to work with in overall design so that both the plot space and the air space above the plot are subject to a lot of geometrical space wastage. The internal spaces are geometrically awkward to use effectively. In short, there is no advantage to domes unless they are used as cupulas to church spaces or large auditoriums and even in large auditoriums, there is considerable geometrical space wastage. All of this would be irrelevant if it were not that space wastage is costly and is not being taken into consideration as a negative apect of dome constrictions. Dome constructions are for very special preferences only and would not seem to have any advantage over modern well designed buildings that use concrete, reinforced concrete or brick construction. In places where gradual subsidence occurs, the dome would simply be tilting or settling downward in many locations. The dome may have advantages for some preferences and novelty but must be considered carefully. The eventual maintenance of the domes is not clear as to the eventual costs over the lifespan of the structure. Domes are no panacea to solve the need for homes or building spaces. Patrick Mackay's comments are spot on. Domes are fascinating and capture peoples imagination - so much so that obvious shortcomings are ignored. they're awkward to build, weatherproof and furnish. Yes, they have an intrinsic structural integrity that square buildings don't have, but there sufficient strength in most available materials to overcome this. I live in a 400 year old square building. It's survived despite not being a dome. I live in a geodome. Built circa 1975, with the standard process... We love our dome, furniture is really fun to place - talk about thinking outside of the box! It allows us to use all the space (I get to use more upstairs than my husband - I'm short!) However, having no stops in the walls create a habitrail fro rodents, termites have feasted, even tho we treat, and it leaks like a sieve, thus rotting the structure, which then cannot be repaired due to the fact that if you remove even one side of a section to replace - the entire structure is compromised... Oh yea, we actually have a vent in the center of the roof... as all geodomes do - to let out heat and condensation. After extensive research, we have decided to build a monolithic dome and are going to cover the exterior with a coat of stucco... solves the 'shell damage' issue - as for bringing in fresh air? YES! We are going to have windows that open, unlike the geodome, which does not. Again, I love my geodome, but living in one has really show me the downfalls. Sorry! I am working on a project about Mars. I must build a city and therefore use something to keep radiation out. Would a special dome keep ot such ishues and allow a possible city? Lets start with the building materials. The foam, it doesn't absorb water all of the air cells are solid and nonporous that is why you can hang the rebar for the shot crete in it, so no sponge. The bag, vinyl is very repairable with kits from your local hardware store, not so much with siding. Toxic smoke, google modern room flashover. I would put a fire suppression system in because domes are so energy efficient. Ventilation, where I live ALL new construction must have mechanical ventilation. And if you painted the air form with a ceramic paint it would extend the life for a very long time. Where can I find an airform to purchase? Can't find any on ebay, I'm told they are reusable up to 100 times, so surely there are some second hand ones around.